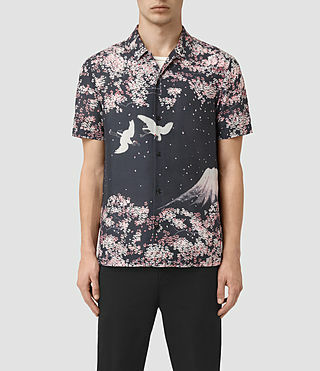 bluebox-away wrote: Absolutely loved this shirt so thanks rizzo for finding it! Minor correction though, it's listed on UK Asos as £69 so a little cheaper than you said. Today I learned ASOS up-charges the US. 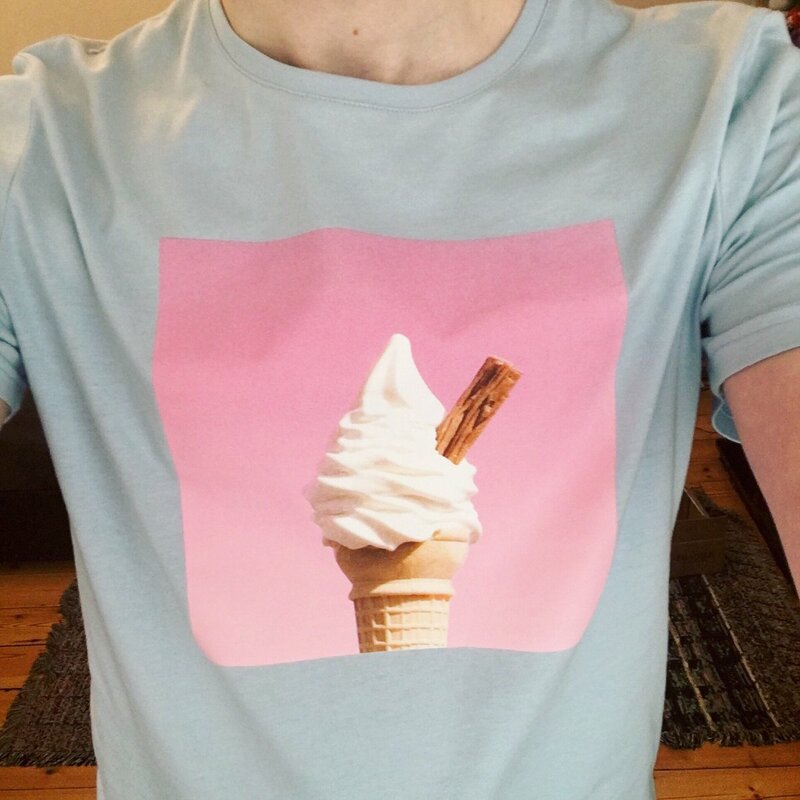 I bought Phil's Christmas t-shirt shamelessly. I'd love to own some of Dan's stuff, but most of the stuff he owns that I'd want is beyond what I'm willing to spend. Gimme dat Givenchy backpack. Agree with them needing to buy more things. I genuinely enjoy going on the hunt for them! Which reminds me.... anyone have any leads on Dan's new white sneakers? I thought they were Givenchy urban high-tops, but nope. idk why but i'm seeing all these ripped/distressed clothes and i'm silently wishing maybe dan or phil would wear them. 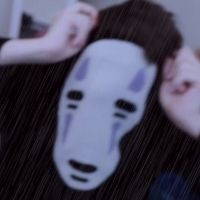 Tbh I'm just waiting for Dan turning up in something that costs 10 times more. 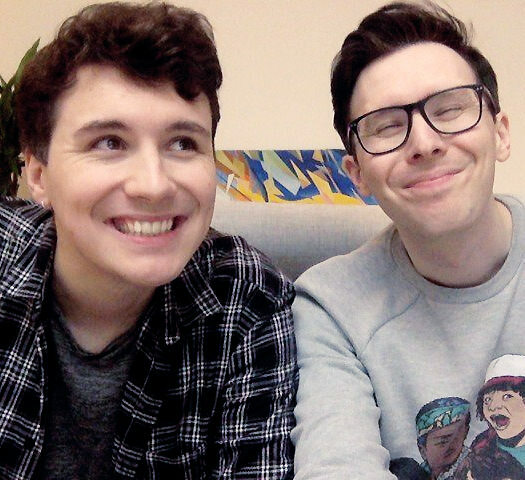 Jesp wrote: Does anyone know where the jumper Phil wore in his baby videos video is from? Sold out on Phil's second fave shopping destination: ASOS. Thank you very much for finding it. 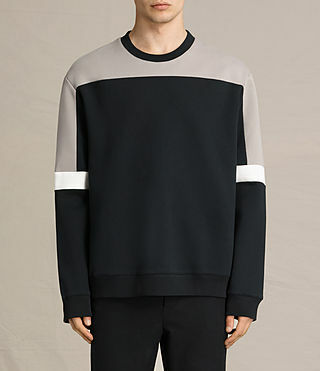 Also, if anyone ever finds this jumper for sale anywhere, or even one close to it, please let me know. oqua wrote: I posted this in the main thread but perhaps this would be a better place. 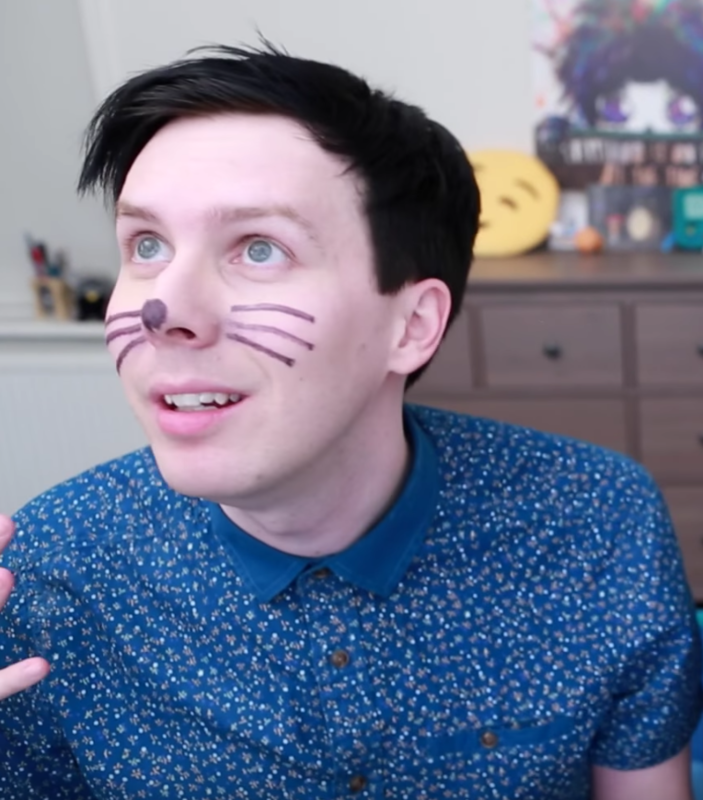 Basically I have a question about a couple of Phil's shirts. Does anyone know what either of these two shirts depict? Are they character from something? Album covers? Random meaningless images? I've been curious for a long time haha. i didn't see anyone reply to this so i hope it's okay to reply to such an old question: i have zero idea what the first picture you posted was, but i'm pretty sure this one is a random portrait of a victorian family with (probably) the mother dressed up as furniture (and eyes edited in to make it look like a ghost). if i remember correctly, these photos were a Thing on tumblr some time back. you can find photos like these by googling "hidden mothers in victorian portraits" or something along the lines, look here for example. also, dan pull up your pants. It's an ASOS Sweater with Zebra Design and Metallic Yarn! Found Phil's T-Shirt from today's M&G. LOVE it! And a Top Man link, because lbr that's where he got it. Just to say; this is not judging them. This is my own curiosity, combined with procrastination of not doing uni work and boredom. Also based on @phanoutfits on twitter, so not e v e r y t h i n g is included in this, this is a rounded up number for each from the information available. Dan's outfits in total comes to: around £9.5k, without clothes he's been given for events, i think he mentioned that? Or maybe he did buy them for events, I don't remember. Anyway, with clothes for events it's around £10-11k. Phil's outfits in total comes to: around £1.3k. Can you tell I'm bored? I'm bored. This entertained me for 10 minutes. It's quite interesting to see the difference between them and to put it in perspective. Some of these outfits date back years, some recently, so it's not like, for example Dan spent £11,000 in a month. And it's their money, they can do whatever they like with it. All saints, Selfridges, Givenchy, acne, Farfetch, Vetements, Asos and Topman. With 74 pieces ( 7 from all saints, 5 from Topman, 3 from Asos, 22 from expensive brands like Givenchy, acne studios, Vetements, Alexander Mcqueen, usually all over £150) meaning that more than 25% of outfits are from expensive brands, around 15-20% are from high street brands (or under £150) The rest are from places like Amazon, Urban Outfitters, ebay etc. With 24 pieces (17 from Topman, 7 from Asos) making up almost 50% of the outfits from those two places. The rest are from places like Amazon, Urban outfitters, ebay etc. again. This is probably not interesting at all and I probably did the math wrong. Correct me if I'm wrong. Just interesting to see the places they mostly shop from, how much on average they spend (Phil seems to go from £10-40 on average, Dan mostly above £100) I actually look at some of the websites where Dan buys from like All saints and acne, and there are nice clothes, but I am a student living off of a loan who could not and probably would not be buy them at the price they are at. His money, his life at the end of the day. If he has the money, he can buy whatever he likes. 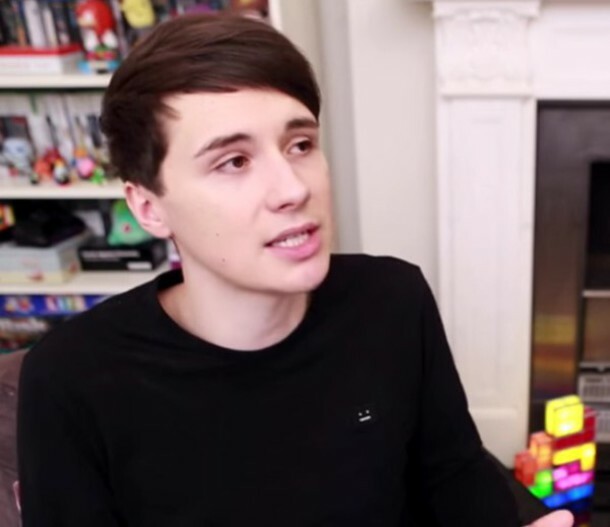 hi, can anyone please help me find 2 black jumper items that dan have worn in the past/recently? - black jumper that has the -_- looking face on the left chest. he is wearing this while he's telling the story. - the black jumper he wears while he's in certain jumpcuts to him acting out university scenes: with the zipper on the side of his sleeves.... he has worn this numerous times and he uses it to pull it over his head aka the "sister daniel" meme. i've been looking around for these 2 clothing items so if anyone can help me find the exact ones or something similar, i'd appreciate it! thank you. whut is the opposite of s m o l , halppy, yellow sun? ahh that's very similar! thanks for finding that and posting it.